1. Which character did you enjoy writing more, Emiko or Skim? Which one did you relate to better? It was a very different writing process for the two characters. Skim was a character I'd had bouncing around for a while. I'd had this idea to write up a goth character that was a little less dramatic, a little less patent leather and a little more NIN t-shirt, than the goth characters I'd seen. Also Skim was written in a diary format, so the text is a lot more subtle and also a little more personal. 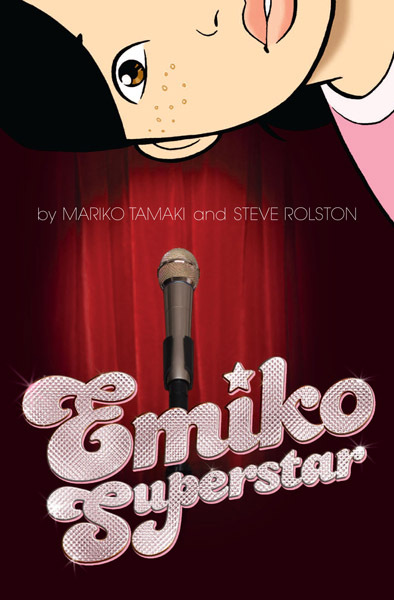 Emiko Superstar was created specifically for MINX. With ES it was more about the overall story, of a girl in this Factory performance theatre like setting, although the character certainly evolved throughout the writing process. 2. Both of your YA graphic novels are about girls that are half Asian. Which nationalities are you a mixture of? I am Japanese Canadian. My mother is "white" and my father is Japanese. I think that has certainly had an influence on the character choices I make, if only because I don't automatically assume them to be white. Or skinny. Or anything else really. That said, I don't think you could say that my works provide any real cultural portrait of Japanese Canadianness. Which may have something to do with me and my background. I didn't even realize I was Japanese until I was in Grade 2. 3. Was your writing process any different between working with your cousin and working with Steve Rolston? Very. Skim was my first graphic novel. 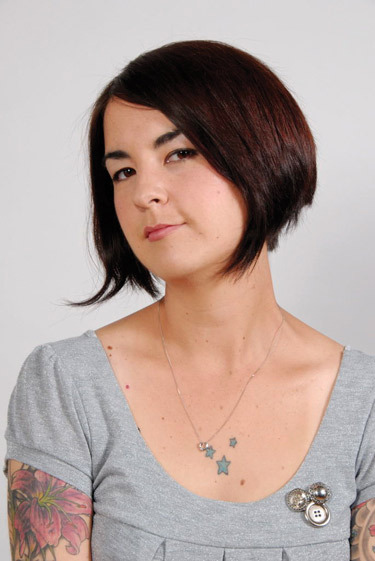 It was also my co-creator and cousin Jillian Tamaki's first. So we just sort of did what felt comfortable and familiar. I had a background in theatre and so the script is very much a theatre script. It was written in scenes and acts, the actual description of the setting was very minimal. Mostly to give a sense of where the scene was taking place, with a few cultural references included - mostly My So Called Life and Degrassi. My focus was really on the narration and the dialogue. DC Comics, who published Emiko Superstar, had a very formatted version of both their script and editing process. Their scripts are VERY descriptive, like movie scripts, with each visual described in great detail. Everything has to be approved, page by page, by several people, which requires a lot of clarification. So with Steve (Rolston) I sent over some very detailed pages. I will say that for both comics, though, my focus was never on the final visuals so even with the script I handed Steve there were lots of changes Steve made throughout the editing process. 4. What's your favorite part in Skim or Emiko Superstar? Hmmm. It changes. I really like the confrontation scenes in the last act of Skim. Skim's discussion of Romeo and Juliet, and her thoughts on the suicide/love story in that work, were pretty fundamental to the story for me. Plus I just love the double date scene and how it's drawn. I mean, I love how the whole book was constructed by Jillian and for some reason that particular scene ALWAYS cracks me up. Emiko Superstar has a ton of illustrations of performance art type stuff I really enjoy. One of my favourite exercises in that work involved me dreaming up a crazy costume and getting Steve to bring it to life. Which he did. Many times. 5. What is one book you've read recently that you recommend to everyone? Let's see. I read Tales from The Goon Squad recently and I absolutely loved it. I think a lot of people did. It is truly an incredible book. Very intricate. Complicated. Overall I am always recommending creative non-fiction. The collection New Kings of Non-Fiction ed by Ira Glass is my personal fav. 6. Do you have anything you're working on right now? Yes. I just finished edits on my next Young Adult Novel to be published by Penguin Books Canada. It's called (You) Set Me on Fire, it's about a girl in her freshman year at college. Jillian Tamaki and I are working on a new graphic novel with First Second (US) and Groundwood Books (CAN). The book will be called Awago Beach Babies. 7. Anything else you'd like to say to everyone? Thanks so much for stopping by Mariko! 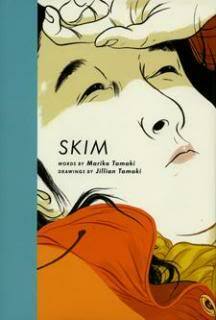 Readers, you can click to check out my reviews of Emiko Superstar and Skim. Brief summary...go buy them and read them!